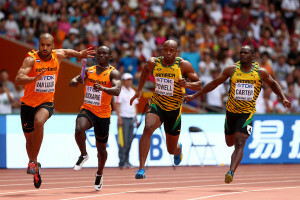 The intense fight between Jamaican sprinters and USA ones always find its ideal battleground in the 4×100. Neat result for the Caribbeans who, with 2 victories, annihilated the star-striped teams. Women started with the quartet composed of Veronica Campbell-Brown, Natasha Morrison, Elaine Thompson and Shelly-Ann Fraser Pryce who dominated English Gardner, Allyson Felix, Jenna Prandini and Jasmine Todd. 41”07, Championships record, against 41”68, such is the Jamaican supremacy. The third place was taken by Trinidad and Tobago with the National record of 42”03. Men’s relay was next. Nesta Carter, Asafa Powell, Nickel Ashmeade and Usain Bolt, after a series of really risky changes, take the baton to the arrival in 37”36 with USA following with a large gap. In the end, Usa got disqualified and the silver medal went to the hosts, China second in 38”01 and bronze to Canada in 38”13.